Despite its innovations, I think it’s safe to say the 3DO didn’t exactly set the world alight, sales-wise. There are various reasons for this, but when I think about how scarce some of its games were back then, it hardly seems surprising. I can’t remember how I had heard about Captain Quazar now but I knew I wanted it. But even when it was originally released, I never saw it in any shops – I had to buy it on mail order, so scarce was it. It’s therefore hardly surprising that most gamers haven’t even heard of it, let alone own it. So, is it one of those ‘flashy-but-no-depth’ games that were so common in the early days of 32-bit gaming, or is it actually any good? Read on! Captain Quazar is a hero for hire, although not an especially bright one, and the tasks for which he has been hired on this occasion are befitting his particular talents. In other words, a good old-fashioned spot of mindless violence! The angry policeman overseeing his work (who reminds me of that newspaper editor guy from Spider-Man) has tasked him with taking down three ‘evil crimelords’ who are turning the galaxy upside down. Namely, Doobah who runs the spice mills on the desert planet of Kragg, terrorist leader Zang who runs training camps on the jungle planet of Kesh, and Ox who is planning an invasion from his volcanic stronghold of Moog. To achieve these aims, he must basically destroy everything and kill everyone. The game is viewed from one of my favourite perspectives – 3D isometric. There are ten large levels which are divided over the three planets, and each has a different objective. 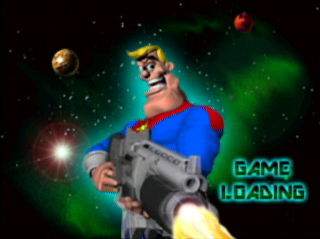 On level one, for instance, you must destroy a set number of rockets containing an addictive spice, though you’ll only get a short time to do this as they start to launch as soon as they appear on the screen. On level two, you must free a load of slaves by locating colour-coded keys and unlocking their cages. 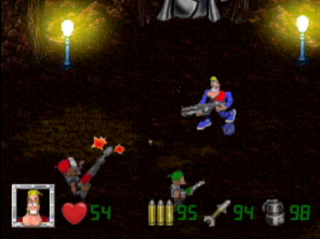 On level three, you must destroy mining equipment in a vast underground spice mine which is very dark. The only illumination is provided by lamps strategically located throughout the maze of mine shafts, and they can be shot, so no mindless blasting is recommended here – it’s damn near impossible to work out where you’re going when they’re broken! On level four – the first level of the second planet, you must find stolen items of art and free hostages before escorting them to a teleporter. 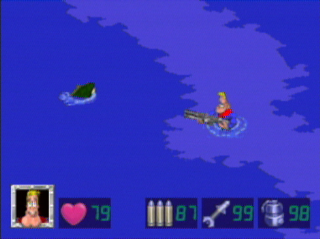 This level is home to vast patches of poisonous grass and stretches of water. Captain Quazar can swim, but the water is home to lots of vicious hero-eating fish! Anyway, I’m sure you get the idea. 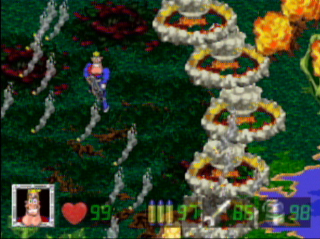 The levels are of course also riddled with various henchmen of the three main villains. 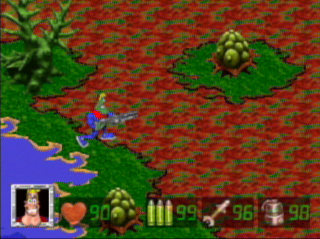 Each planet features some unique enemies not found elsewhere too. For example, the desert planet features spice henchmen – some are puny, some are not. Some have orbiters, some are even invisible. The third level of this world also has dangerous tunnelling machines which can inflict pretty major damage as you might expect. 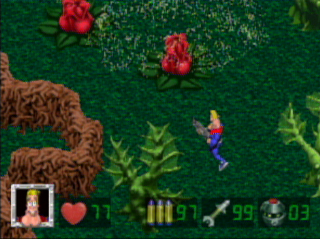 The jungle world features terrorist henchmen, deadly plants and flying probes, and the lava planet features the most enemies of all including bullet and missile-proof military henchmen, floating turrets, radars, brutes and invincible electric snakes. All of these enemies can cut the Captain’s quest short in a hurry too as he only has a limited energy meter and a few lives. The Cap’n has a few tricks up his sleeve to take out some of these irksome minions though. These include his rapid-fire personal cannon which can also be upgraded to a super-gun or equipped with high-powered missiles, grenades, super-grenades, flamethrower and an electric ray. All of these weapons are limited in supply, so keep an eye out for extra ammo. Some random enemies leave sparkly diamond thingies behind when killed, too. Collect this ‘mana’ whenever you see it – each time you pick some up, your mana-meter will go up by five percent. When it gets to a hundred percent, you’ll get an extra life. Other useful items are the force shield (temporary invincibility), invisibility potion, speed boots, orbiter (a drone that follows you around and zaps any enemies that get too close), antidotes (which counter the effects of the poisonous plant life on the jungle planet), snorkels (which let you breath underwater) and flares (which help you to see in the underground mine). Extra lives, continues, door passes, forcefield passes, cash and gems can all be found lying around too and there is also a shop that appears at the end of each level (and occasionally in the middle of a level). Pretty much anything can be bought for the right price from ammunition to health. 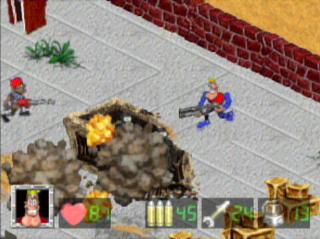 The game’s levels don’t just feature hoardes of enemies though – also to be found are various types of buildings. Each, when destroyed, has a certain effect. 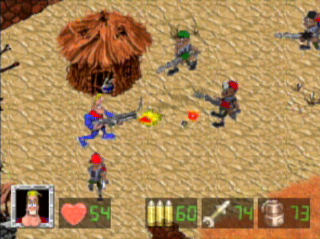 For example, each ‘area’ of each level contains a barracks. If this is not destroyed, the flow of enemies will be constant. If you destroy it quickly however, you can soon wipe the enemies out. Other buildings and features include teleporters and elevators (both of which require a code), guardhouses/ headquarters, which contain a henchman who can then be interrogated (they’ll usually give you teleporter or elevator codes), and safe houses (which invariably contain money or gems). The desert planet even features the odd oasis which replenishes your health to a limited degree. With all these areas to explore and items to collect, you might be thinking that this is a big game and you’d be right! I was recently playing it for five to six hours and I only reached the start of the fifth level which is absolutely enormous! Luckily there is a save-game facility at the end of each level, and an in-game map which only shows the areas that you’ve already explored. Some destroyed buildings leave a map clue behind showing a secret area on the map, of which there are many. 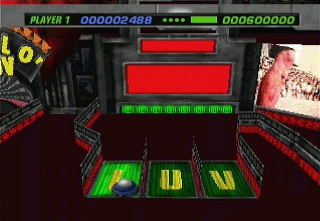 There is also a simultaneous two-player mode with the second player controlling Captain Quazar’s partner, Lieutenant Pulzar, but it’s not split-screen so it can get a little crowded, and both players tend to get in each other’s way. The game is tricky right from the start, and it gradually increases in difficulty from that point on – the lava planet is rock! (snigger) This is a tough game though, I still can’t finish it. Can anyone? As mentioned near the start of the review, I have a great fondness for isometrically viewed games, probably stemming from my Speccy gaming days, and this is a good one. Each level is colourful, varied, features amusing looking enemies, and the scrolling is nice and smooth. 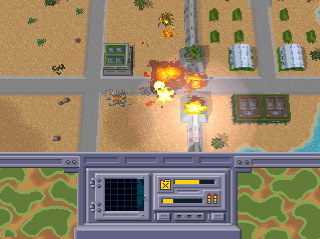 The explosions are particularly impressive, especially after a super-grenade has been unleashed but, bizarrely, the explosion will only occur if the area in question is presently on the screen – you could throw a super-grenade, immediately run away, and come back ten minutes later and witness the ensuing explosion! There is also a bit of slow-down when things get busy, but it’s not bad enough to affect the gameplay. 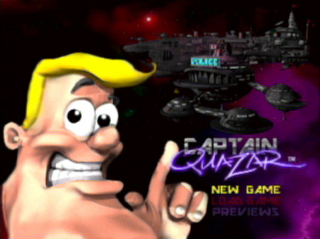 Like many early CD-based games, Captain Quazar also features a rendered intro sequence which is probably one of the best I’ve seen! It begins with a short rendered story along the lines of “The galaxy was once a lovely place to live, but then things changed. A band of intergalactic outlaws started causing chaos” etc, which is narrated in an amusingly frantic fashion. This is followed by a Captain Quazar rap performed by some highly humorous robots. Equally amusing, but rap-less cut-scenes punctuate the action too, mostly showing the more-brawn-than-brains Captain himself. 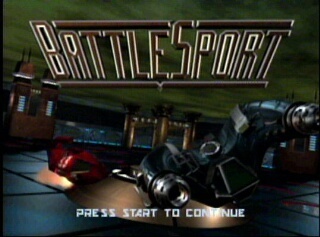 The game also features some great music. 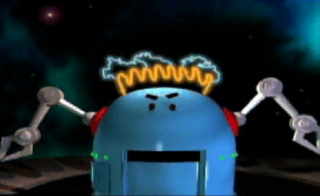 There is a different tune for each of the ten levels, and some superb cartoon style sound effects are also present. The best thing however, is the Captain’s voice – he sounds even stupider than Homer Simpson! This is a pretty tough game and a bit of practise is required before significant progress can be made. It took me a while just to get off the first level! Once you’ve got used to it though, it’s an enjoyable romp, and it’s also very satisfying to play, what with all the wanton destruction and all. Even the walls can be destroyed in some areas! Control of Captain Quazar is pretty good, athough it’s sometimes difficult to hit the diagonals in a hectic situation. But most importantly, playing this game is enormous fun. It’s challenging, occasionally frustrating, but remains highly enjoyable nonetheless, and features some nice touches like the police chief shouting at you and even singing songs if you leave the game paused too long. Unfortunately, good games are pretty rare on the 3DO, but ones that didn’t appear on any other consoles are even rarer still. This alone makes Captain Quazar noteworthy. It’s not easy to get hold of but it’s well worth the effort if you want to try something that’s not only a bit different, but also great fun.